Whitetail deer are known for being elusive, but in the cattle pastures and wide-open fields of CRP fields in Kansas there are not a lot of places for them to take cover as they would in a heavily wooded area, such as Illinois. Our leases and stand/blind locations are designed with deer movement in mind. Deer like cover, so they naturally head for wooded areas. All the wooded parts and pinch points of our properties have strategically placed stands to get you that prime opportunity at your trophy Whitetail deer. 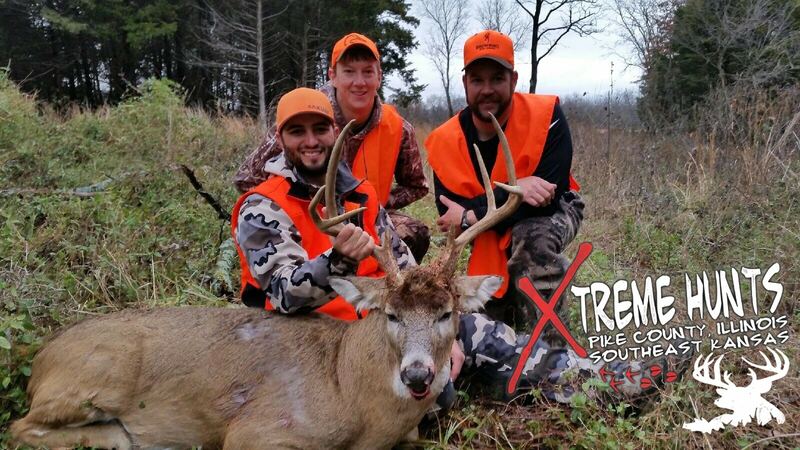 Xtreme Hunts outfits free range whitetail deer and turkey hunts on 9000 acres utilizing ladder stands, loc-on tree stands, hay bale blinds, box blinds and pop up blinds. 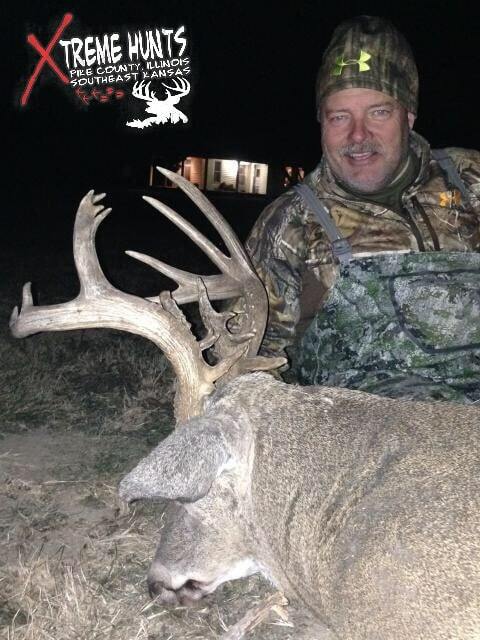 We provide very low hunting pressure to all of our hunting ground with a strict 140” minimum on all deer harvested. Although there are no trophy fees, we do implement a penalty fee of $1000 for a deer harvested below the 140” minimum. The fine is set in place to structure the age of our deer herd and grow the quality bucks we want our clients to harvest. Our hunters know there will always be quality bucks on the ground that we outfit. 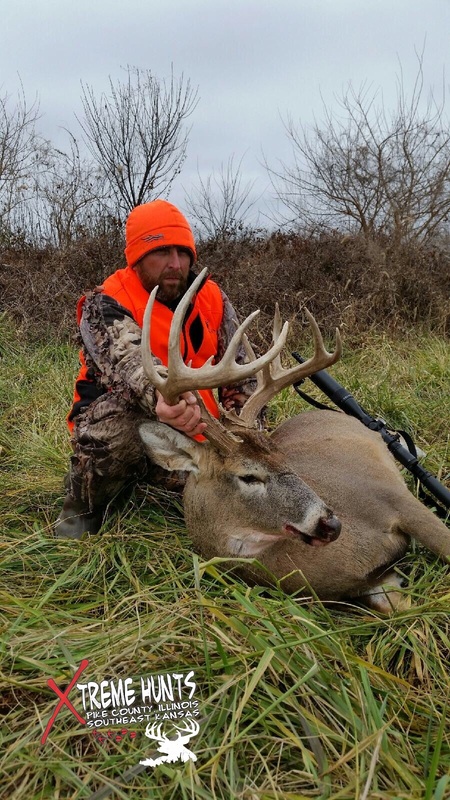 Outfitters who have a 125” minimum are devastating their deer herd and will very rarely harvest bucks in the 150” range because they do not let their bucks grow to maturity. 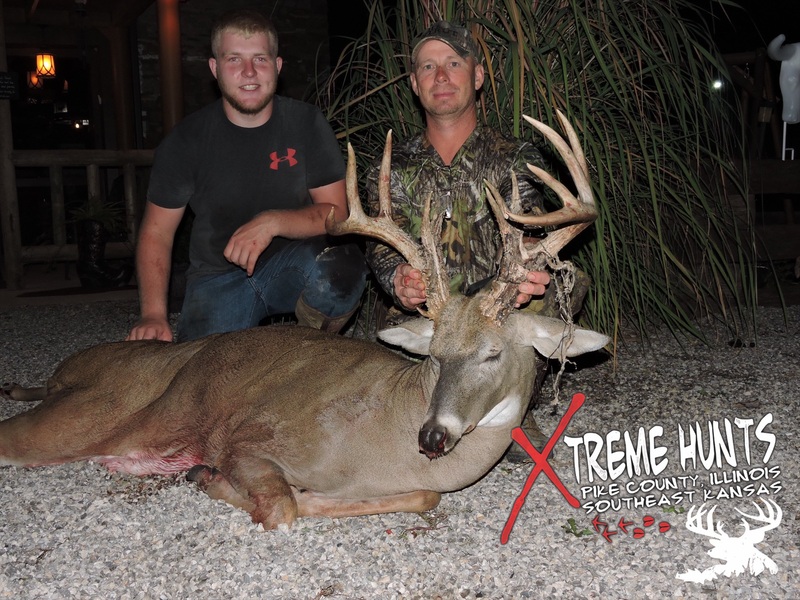 We have the fines in place to ensure quality bucks are available every time you sit in the stand as well as every year you come back to hunt with Xtreme. Mature bucks are here, we just need to work as a team to harvest them with a little luck, we will always have a memorable hunting experience. 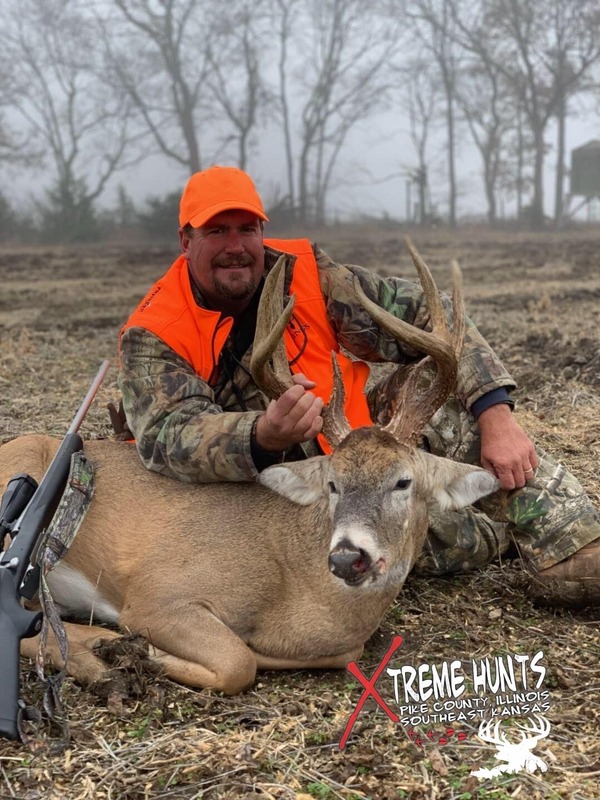 Xtreme Hunts offers a mid September muzzle loader hunt for traditional deer hunters that choose to hunt bachelor group bucks over food plots and standing soybean fields in early fall. Hunting this time frame is a great way to catch bucks either in velevt or just coming out of velvet where they can be very predictable in pattening one of these Kansas giants. If your a Archery hunter then we have a prime rut archery hunting experience for you during the first 3 weeks of November chasing these rut crazed Kansas whitetails. Trust me you will not want to leave your tree stand during the rut in Kansas. If firearm hunting is your method of deer hunting then Xtreme Hunts has you covered offering rifle firearm hunts that traditionally open the first Wednesday after thanksgiving, I can honestly tell you its hard to beat the smell of burnt gun powder in a hay bale blind on a cool crisp Kansas morning during the rifle season in December followed by walking into a deer camp that feels like home and the smell of Ms.Marti's cooking in her western style hunting lodge. 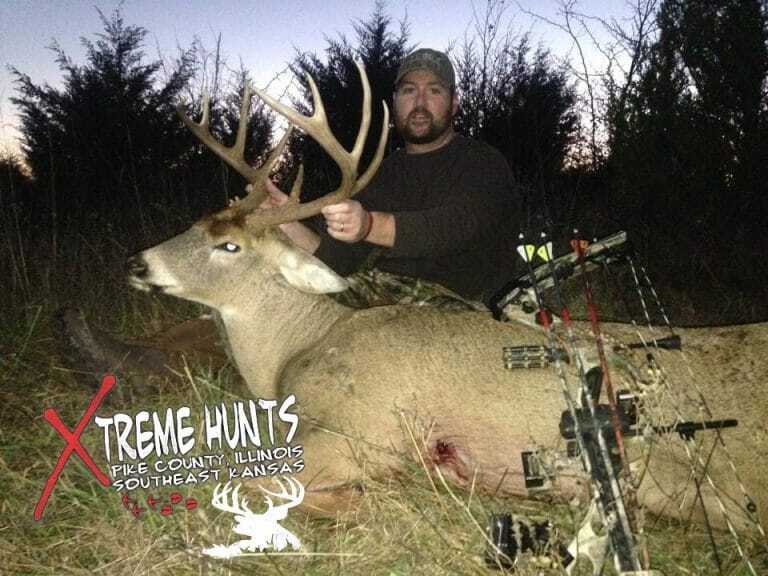 Xtreme Hunts operates Whitetail Deer Hunts in Southeastern Kansas unit #11 located in Bourbon & Crawford counties. Deer permits are on a draw system, first time applicants have a very high success rate at drawing their deer permit the first time he or she applies. The Kansas nonresident deer permit lottery typically opens April 1st to the end of April, this is also the time to apply for a prefernce point which we strogly recommend if you plan on hunting Kansas in the future. For more information on permits and application periods please visit our Kansas Dates and Rates page or the Kansas DNR website by clicking one of the links above. Don't forget to visit our Gear Bag page so you have the right hunting gear when coming to Southeastern Kansas on your Trophy Whitetail Deer Hunt.